This year’s Earth Day 2010 commemorated the 40th Anniversary of Earth Day. At Minot State University, the day commenced with a greater variety of events than has been held in past years. As was highlighted last year, businesses from the community sponsored Green Booths in the poster session. A similar poster session was held last year. This year’s session contained 24 displays. Many of the Earth Day displays highlighted entries from the "Best New Sustainability Idea" contest, a new event for Earth Day. The contest winner was Crystal Michels from the Records Office. Her idea was to change the procedures for cross-shredding to allow the workshop to take secured bins of sensitive documents to the workshop for shredding there. This move will enable the cross-shredded paper to be recycled, rather than discarded, as now happens. An idea receiving the most votes is a simple one to implement: have all copiers set to duplex documents. This simple act could cut the paper use in half. The twelve ideas received will be researched for campus implementation throughout the year. A returning event was "Campus Cleanup." Over 100 faculty, students and staff members volunteered to green the campus. Dr. Fuller assisted with the campus cleanup on his return from the Earth Day activities at Dakota College in Bottineau. The messiest areas of campus are up near the North Parking Lot, especially where the snow removal is still melting. Much of the garbage from the campus had blown down from the hill above the Amphitheater near the telescope. All participants in the "Cleanup" received tee shirts with the design concept, "It Starts Right Here" submitted by contest winner Sarah Walker, a student at MSU. The design may be used in future Earth Day campaigns. Over 1000 pounds of garbage was collected. Additionally 30 pounds of aluminum was gathered and recycling. 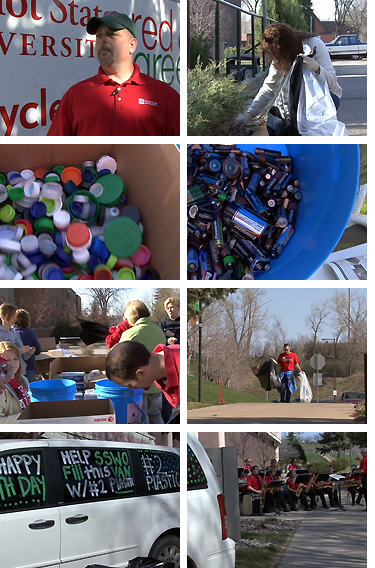 Campus organizer, Linda Olson, "would like to thank all of those who helped make this Earth Day a success." Her favorite activity was the battery drive, as it "may make a real difference in Minot’s water quality in the future." The battery, bottle cap drive will continue until the end of the semester, so bring your old batteries, tape the anodes and place them in the appropriate containers at the recycling kiosks.